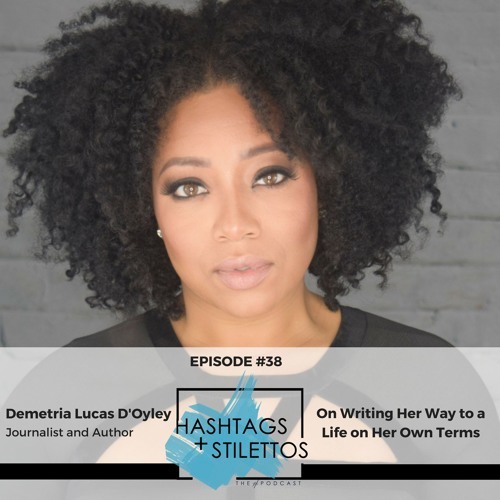 Demetria Lucas D'Oyley is an award winning journalist and author who at 30, leveraged her 'ABelleinBrooklyn' blog into a dream job as the relationships editor at Essence Magazine, guest starred as a relationships expert on her first reality show and landed a book deal with Simon and Schuster. Safe to say, things were going pretty well. Then, she quit that job she loved so much to pursue a life of entrepreneurship and eventually self-published her second book. On this episode, we talk about the origins of her blog, her early career moves, why she left Essence, navigating entrepreneurship as a writer and how she's been able to basically write her way to a life on her own terms. Text HASHTAGS to 444999 to join the email list. Email hashtags@hos-pr.com to submit questions. Social Media: Instagram.com/DemetriaLucasDoyley Twitter.com/DLDoyley www.demetrialucasdoyley.com Instagram.com/HashtagsandStilettos Instagram.com/MissSuccess Twitter.com/MissSuccess Hashtag: #HashtagsandStilettos Show Notes: hashtagsandstilettos.com/demetria-lucas-doyley Like this episode? Write a review on iTunes! My mentor says the same thing, Ask for...all they can say is yes or no". Great catch! Money, finances, asking for what you want! I picked up on this as well.